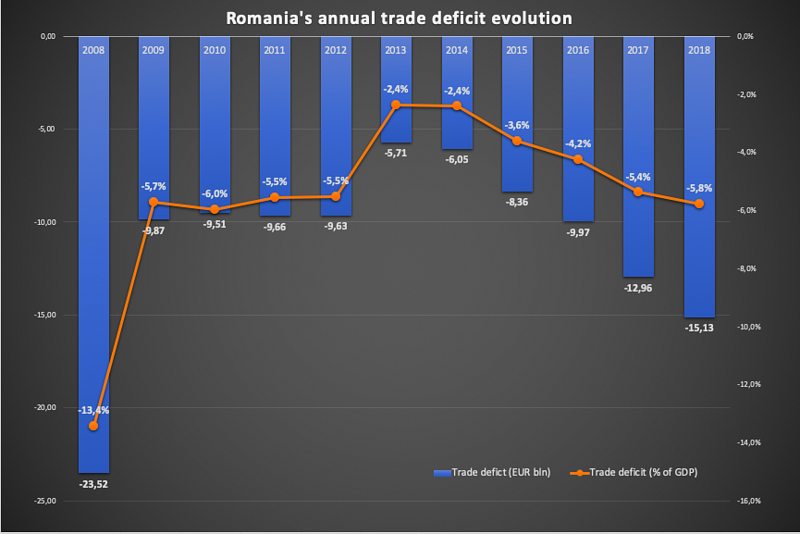 Romania's trade deficit almost tripled in the last five years (2018 versus 2013) reaching its highest level after 2008. The rise in imports, driven by strong domestic demand has significantly outpaced the evolution of exports, which has slowed down amid lower economic growth in Europe. Imbalances are likely to continue growing this year, January data shows. Romania’s foreign trade gap widened by 62% year-on-year to EUR 1.26 billion in January. Thus, the trade gap in the 12 months ending January was EUR 15.6 billion, 18.9% higher than in the year ending January 2018 and some 7.8% of GDP. The data is reported under FOB/CIF terms by the National Institute of Statistics (INS) and shows that the local producers do not cope with the rising demand. Exports increased by a disappointing 1.6% year-on-year in January, the weakest performance since April 2017, to EUR 5.51 billion. Imports, by contrast, surged by 9.2% year-on-year to EUR 6.77 billion. The disappointing performance of the country’s exports came amid the weakening outlook in Europe, Romania’s primary export market, therefore it is likely to prevail for some time in the future as well. Imports, in contrast, have been driven by rising demand propelled by households’ incomes. January’s foreign trade followed the pattern seen in the past years when Romania’s imports increased faster than the exports. Imports in the rolling 12 months ending January increased by 9.0% year-on-year (to EUR 83.4 billion) while exports advanced by only 7.0% year-on-year to EUR 67.8 billion. The trade deficit occurs when a country imports (for consumption or investments) more goods than it exports. 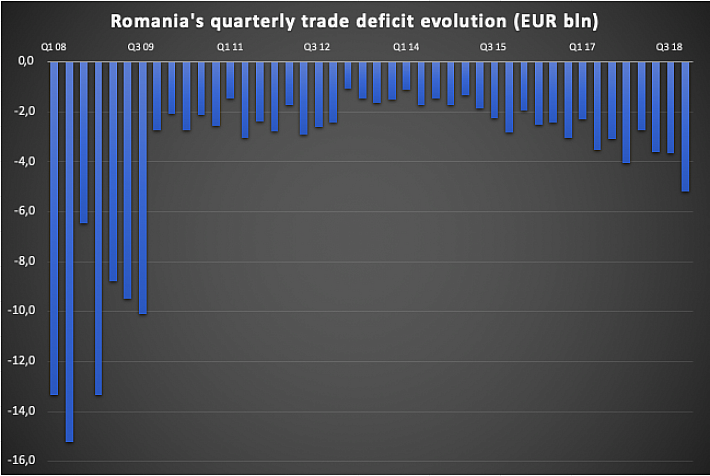 When such deficits are wide and persistent, as is Romania's case, they typically surface as pressures on the exchange rate -- that not surprisingly became visible in Romania recently. Exchange rate corrections (toward weaker local currency) act as automatic stabilizers, making imports costlier and stimulating exports. Moderate currency weakening is therefore expected, but this is far from enough to turn the trade deficit into a surplus. Separately, besides pressuring the exchange rate, persistent trade gaps typically surface in gross external debt (unless non-debt generating financing is found). Below 50% of GDP, Romania’s gross foreign debt still remains moderate. On the long term, a country must either balance its trade with goods or find another way to finance it -- by a surplus in the trade with services (net export of services) or by foreign investment inflows. The accumulation of debt is an alternative, but the least sustainable one. 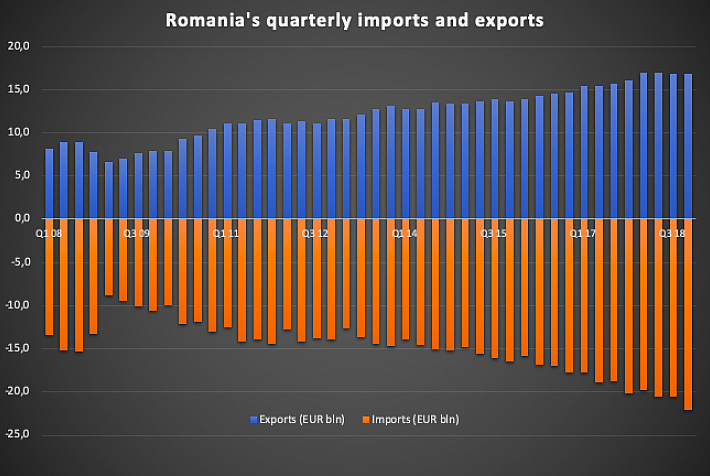 Romania is financing its net imports of goods mainly by the net export of services (the net export of services covered more than half of the net import of goods in 2018) but also by the inflow of funds from the EU budget and the wage remittances (money sent home by Romanians working abroad). Since these financing resources are not enough, the country runs a Current Account deficit (net outflow of money) that can be financed either from Foreign Direct Investments or from debt accumulation. Each of these two alternatives has its downsides: FDI results in permanent outflows (dividends), while the debt must be repaid. Romania’s gross external debt (GED) increased by 5.4% (EUR 5.1 billion) in y/y terms according to the central bank data. Notably, the EUR 9.4 billion Current Account deficit in 2018 resulted in a lower advance of the GED over the year. Consequently, the GED-to-GDP ratio at the end of January 2019 was 48.7%, lower than the 49.6% ratio calculated one year earlier at the end of January 2018 and a moderate level in absolute terms (compared to peers). Romania’s Current Account (CA) deficit, which has at its core the net import of goods, is on the verge of exceeding the sustainability benchmark (4% of GDP, the average over a three-year period). The CA posted a deficit of EUR 9.4 billion in 2018, 58% more than the deficit posted one year earlier, in 2017. Compared to the year’s GDP, the CA deficit widened from 3.2% in 2017 to 4.6% in 2018, thus reaching a level that exerts certain pressures on the country’s external balances heralding an exchange rate correction. How ample will this be, depends on the elasticity of exports and imports among others. On a broader perspective, the trade deficit did not come as a surprise, in the context of the consumption-driven growth. The state forecasting body projected EUR 14.7 billion trade deficit in 2018, under its forecast issued in February 2018, and the actual figure was only slightly higher: EUR 15.1 billion. CNP correctly predicted that imports would grow faster than exports. Private consumption has been and will remain the primary growth driver in the coming years. In principle, this should not necessarily push up imports -- but this depends on local producers’ ability to supply the rising demand. The primary driver behind Romania’s trade deficit is the robust domestic demand. Actual final consumption hit 80% of GDP in 2018, up from 76% in 2014-2015 and is close to the 81% peak seen in 2008 before the recession. But the weaker external demand has emerged recently as an increasingly important factor. The quarterly exports diminished in Q3 and Q4 last year compared to the first two quarters of the year, against the seasonal pattern. The annual growth of exports plunged to 2%-3% year-on-year in November-January, against a longer-term average of over 8% year-on-year projected by the state forecasting body. The state forecasting body (CNP) sees no improvement in the foreign trade balance over the next four years: imports are seen as growing by 9% per annum (p.a. ), versus more moderate 8.5% p.a. rise in exports. Consequently, the trade gap is expected to rise by an annual average rate of 11.2%. Somehow, the same CNP expects other inflows (funds from the EU budget) to offset the trade gap and result in actually smaller Current Account deficit (2.4% of GDP in 2022, down from 4.5% of GDP in 2018). But the whole scenario is grounded on expectations for annual GDP growth rates of over 5%. Under a more realistic scenario, growth rates around 3% would result in smaller trade deficits. Anyway, the consensus projections indicate the CA deficit above 4% of GDP on the medium term. On the short term, the exchange rate correction and several major investment projects (e.g. Ford launching a new model) might smooth the trade gap’s widening. However, on the longer term, the infrastructure investments and the regulatory predictability (needed by the offshore gas projects in the Black Sea, but also by other private investors) are vital for achieving at least sustainable trade balance.